Yesterday, we headed to our neighbor base... or wait, I should say post, because it's Army... and we visited "Splish and Splash" for the very first time. Yes, I feel sort of guilty taking our little one there, without Papa...since he's the fish in the family and all... but I couldn't resist when other Moms (friends) invited me out with their little ones. Even though we spent most of the time (she made it 2.5 hours in this place!) doing what Charlotte wanted to do (run through all the sprinkler like things, and splash, and try on other people's shoes...oh, and lets not forget, beg for food-even though I fed her right before we left, and had snacks for her), I had a great time. We'll definitely be returning... especially since I didn't get any other photos of the place and of Charlotte, other than the one down below. I mean seriously... do I really want to truck my Nikon around and through water park features... this Mama had to keep up with her daughter's agenda. 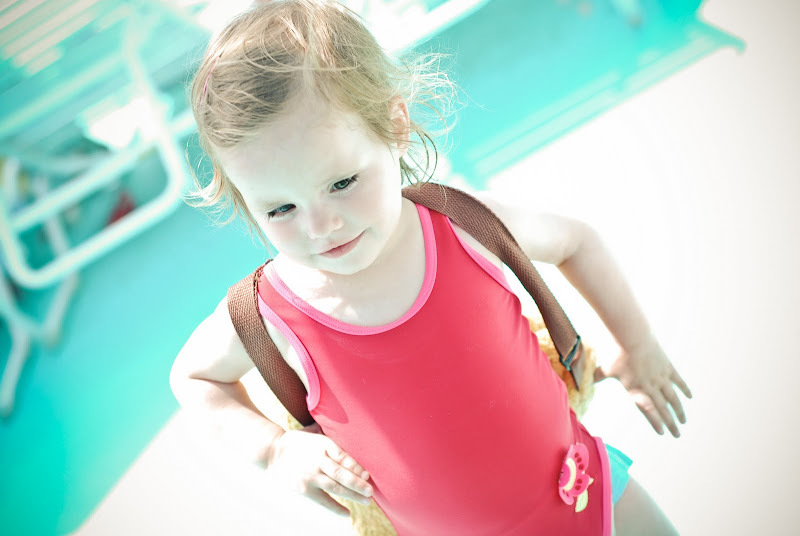 I love how the combo of sun and water= a very tired little girl, with "sun-kissed" features... I put SPF 60 on her, and she still picked up some color... it's that Ukrainian blood. 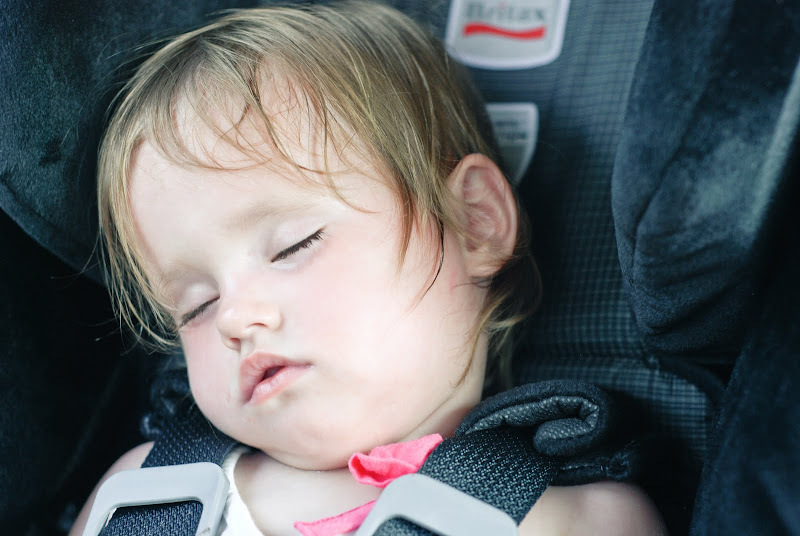 By the way... this is the very first time she fell asleep in her car seat. I was rejoicing quietly as I drove home. aw, my heart is melted into a little puddle next to my feet. that is so precious!! I love looking at the kids when they are sleeping. It is the only time they are still! She is absolutely adorable. It's easy to see why you are smitten! You are so correct about her "plumping up" I love the way kids look "sun-kissed" even after they have been out in the sun all summer long, they still look rosy! I'm so glad that you are able to go hang out with other mothers and their kids! i would be smitten too! 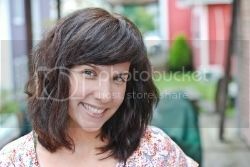 she is so pretty, karen!!! so glad she slept. :) thank goodness for long car rides where they actually sleep. We raised three under the motto: "Keep'em busy, keep'em tired!" Pool time was about the only thing that tired them out so much that WE ACTUALLY GOT SOME PEACE and quiet for a few hours. You have STRUCK GOLD -- figured it out -- now you know how to make it a "precious day." Just go to the pool. (and look what happened to your husband!!! He ended up with a swimming scholarship for college). The world is in perfect balance again. We had so much fun with you gals! Can't wait to do it again!!! 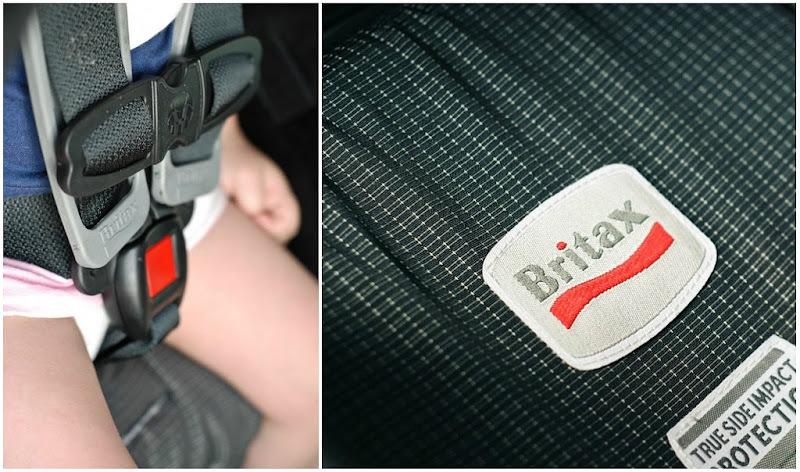 I love the Britax....we have the exact same one! She is SO beautiful. I had to show my husband these pictures of her because they are just too adorable not to share. I just want to squeeze her and kiss those little cheeks! What sweet pictures!!! She is so precious! Giveaway: Ashley from "One in the Hand"